When the wind increases to the medium range, the boat begins to really power up and the crew weight is needed on the windward rail to sit the boat down. This is when we need to change gears and flatten out the sails to reduce drag, improve boat speed and point higher. The backstay should be pulled onto a medium tension which flattens out the mainsail. This also helps to tighten the forestay which automatically flattens the entry on the headsail. 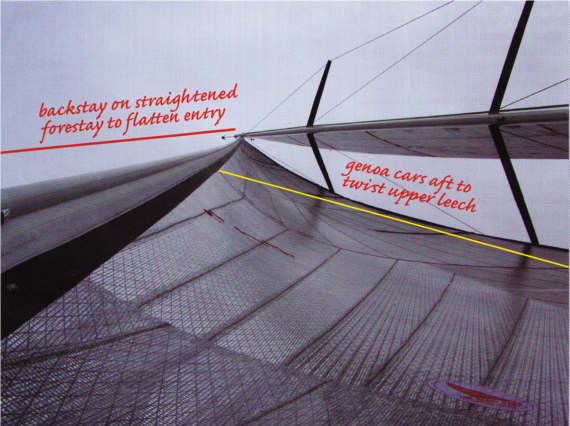 The luff tension on both sails should be increased to keep the draft at their designed positions. Be careful to not over tension the luff on the mainsail as this can cause excessive back winding by moving the draft to far forward. Having just enough tension to remove the horizontal wrinkles in the luff seems to work well on most mainsails. 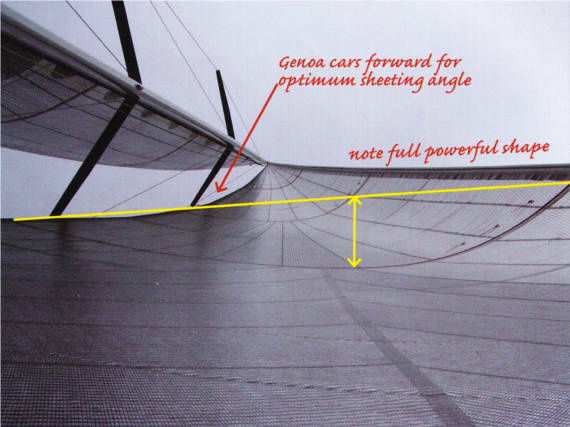 The headsail luff also needs just enough tension to remove the horizontal wrinkles at the luff tape for luff foils or just enough tension to remove the sags between the hanks on hanked headsails. The traveler should be positioned so the boom is on or slightly to leeward of the centre line. The mainsheet hand needs to work it up and down through the gusts to keep the boat on the correct angle of heel. The mainsheet should be trimmed to have the upper leech ribbon almost flowing as this helps with higher pointing ability. The genoa cars need to come aft when the boat becomes overpowered as this will flatten the foot area and exhaust the upper leach. The genoa sheet should be tensioned to keep the leech at approximately 20mm from the spreader. The helmsperson needs to steer as efficiently as possible to keep the boat moving and to keep the boat’s speed up. Many helmspeople make the mistake of pinching up and pointing too high, which results in them losing boat speed. When that happens the boat slows down, it reduces the lift generated from the keel and it increases the boat’s leeway. It is important that the helmsperson keep the speed up. Crew should sit on the windward rail to sit the boat down to reduce excessive heeling and present the maximum sail area to the wind. The headsail is set for medium to heavy conditions. The backstay is on to straighten the forestay and flatten the entry. The genoa cars have been moved aft to twist off the upper leach.